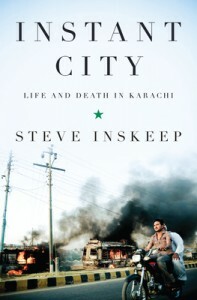 I’m reviewing Instant City: Life and Death in Karachi by Steve Inskeep as part of a TLC Book Tour. Other bloggers are also reviewing the book throughout October, and you can find links to their reviews here. I received a complimentary copy of the book, and I’d like to send it to a reader if anyone who’d like to read it doesn’t mind a copy with some underlining and margin notes. If you’d like it, just comment saying so by Wednesday, November 2nd. If multiple readers would like it, I’ll pick one at random. In a manner that is rare for non fiction, Instant City is really a page turner. Inskeep takes us through the history of Karachi from Pakistan’s independence in 1947 through the present, stringing personal stories of social entrepreneurs, politicians, activists and real estate developers together to tell the city’s story. He revolves the historical accounts around a 2007 bombing, in which unknown perpetrators bombed a procession that was part of a Shia religious holiday. Following the bombing, rioters burned down blocks of wholesale retail buildings. Despite the arrests of four suspects, many of the city’s residents are so distrustful of the city’s MQM government that they believe that city officials caused the bombing and subsequent fires in order to clear out the neighborhood’s current tenants to make way for more glamorous businesses. While the city’s mayor passionately denies that city government had any involvement with burning its citizens’ property, that residents have so little faith in their government demonstrates how absent the rule of law is in Karachi regarding property rights to land. In with the history of the city’s history, growth, and conflict, Inskeep covers land use in Karachi in considerable detail. To me, “Groundbreaking” is the most interesting chapter, where Inskeep details the experience of slum clearance in the city during the 1950s. Karachi had become home to millions of refugees, predominantly Muslims from India who moved there either by choice or by force, who had settled in camps downtown. City leaders wanted to move these refugees to the outside of the city and hired the Greek urban planner Constantinos Doxiadis to create a plan for relocating these people. Doxiadis approached the problem through gathering as much local knowledge as possible. He designed the homes in a traditional South Asian style, taking advantage of shade and building homes so that breezes would help keep them cool without air conditioning. These homes would be occupied by low-income people as part of a rent-to-own program, so he designed them to be small and efficient, keeping the needs of the intended residents in mind. Throughout the process, however, Doxiadis realized that the plan had a major flaw. While these residents lived in informal settlements, they lacked adequate shelter, but they lived close to their jobs. By forcibly removing them to Levittown-style suburbs in North Karachi, well-meaning urban planners inadvertently made poorer the very group they were trying to help by saddling them with difficult and expensive commutes to job opportunities. For these people who were already living in poverty, this unintended consequence of urban planning could literally be the difference between life and death. Whatever legal cover the city council may have provided, the new construction led to an ethnic battle, which the MQM’s rivals also failed to restrain. Protests ended in gunfire, criminal charges were filed, an officer of the court was threatened at gunpoint, and activists were eventually killed…. Politicians pushed all the buttons of a volatile area, and the situation exploded. Absent more evidence, Karachi’s dominant political party could deny responsibility for the assassination of Nisar Baloch and his successor, Nader Baloch. But the MQM could not avoid responsibility for helping to create a deadly situation. [Migrants from rural areas] represented the most powerful force in the instant city: the desire of millions of people–simple, quiet, humble, and relentless, no matter what the odds–to make their lives just a tiny bit better than they were. Sometimes the most discussed aspects of instant cities include violence, crime, disease, and squalor, which of course are horrible realities that Karachi’s social entrepreneurs and businessmen alike seek to improve. But the unseen side of instant cities is what drives people to move from subsistence lifestyles to cities where they and, perhaps more importantly, their children will have opportunities for a higher standard of living. Cities are growing because many different types of research have demonstrated what new city residents already know: dense urban cities allow for people to do better for themselves (and others in the process) compared to the relative isolation of small towns or rural areas. All in all, Inskeep has succeeded with a gripping book that helps convey the importance of urbanization for the global community. I appreciated that he identified many of the problems that come from government failure in Karachi from the perspective of many different types of citizens and provided so much information about the city’s past and present in a fascinating and accessible work. Inskeep makes just one major point that I disagree with. He suggests that a stronger metropolitan planning authority is what Karachi needs to allow for more stable land use policy. I tend to think that instead, a legal system that supports the rule of law and protects property rights is what would help the city’s development rather than a master plan to enforce permissible land uses. Groundbreaking was one of my favorite chapters. I said, “Inskeep recounts Doxiadis’s hands-on involvement with design and construction and examines the failures of the two planners to meet their goals. The comparison to Robert Moses [made earlier in the review] is my own. The general and the planner dreamed of the future Karachi but it seemed they wanted to ignore the current Karachi, of shoddy construction, electricity theft, religious strife, and low literacy. I’d love to read it! My wife stayed in 2005 in the Marriott that was bombed in 2006, on her way to assist victims of the Kashmir earthquake, so we’re both interested in Pakistan. I definitely want to read that book! You make a good point about the need for a strong legal system – I agree that it would likely solve some of the problems mentioned by the author. I’m glad you found this to be an engrossing read. Thanks for being on the tour! In a workshop on the analytics of urban conflict during my final term at MIT, Karachi served as the focus of a case study from which I took note of the ‘three mafias’ pervading the city: the land mafia taking advantage of ambiguities in property rights, the water mafia employing violence and sabotage against rivals attempting to take over water infrastructure, and the transport mafia triggering traffic jams along major thoroughfares. It was notable how government policies intended to discourage or ‘bypass’ informal activity both criminal and benign often underperformed or triggered unintended consequences that undermined prior objectives — for example, informal settlements now populate the undersides of road viaducts the government constructed with the intent of limiting the transport mafia’s grip on infrastructure. Adaptation and resilience among the resident population in the face of weak government institutions and informality as the norm for economic activity merit further study as part of an effort to bridge the gap between social theory and policy to stem chronic violence in rapidly growing cities in the developing world. I would appreciate a copy of Instant City and examine how Inskeep addresses the issues discussed in the conflict cities workshop. Thanks for all of your interest in the book. I received two emails of readers who were interested in the book along with the four of you here. I picked at random one of the email requests. I’ll be doing another TLC Book Tour at the end of the month, so I’ll do the same thing then.